This post started with Adam’s problems (pt 1). So yesterday ended in frustration, meaning that today (yet again) I had to finish off that section of work before doing today’s work. So the pedal had to be removed several times to be modified and get enough clearance for that nut. The problem being that I didn’t want to remove that section of the pedal casting completely. This drum was the most difficult, which is why I tackled it first. The other two were more straight forward, but still needed to be checked and tweaks made. So the new mechanisms are all in. They are simple and effective. The ball joint between both rods is the key, it compensates for any alignment issues between the base casting and the bowl. 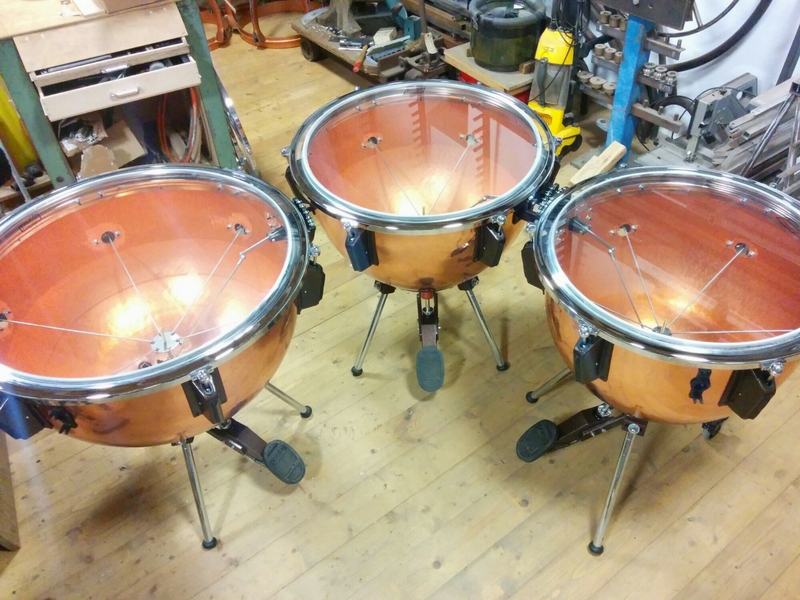 Now the new mechanisms are in, the rest of the overhaul can be done which is straight forward on these drums. 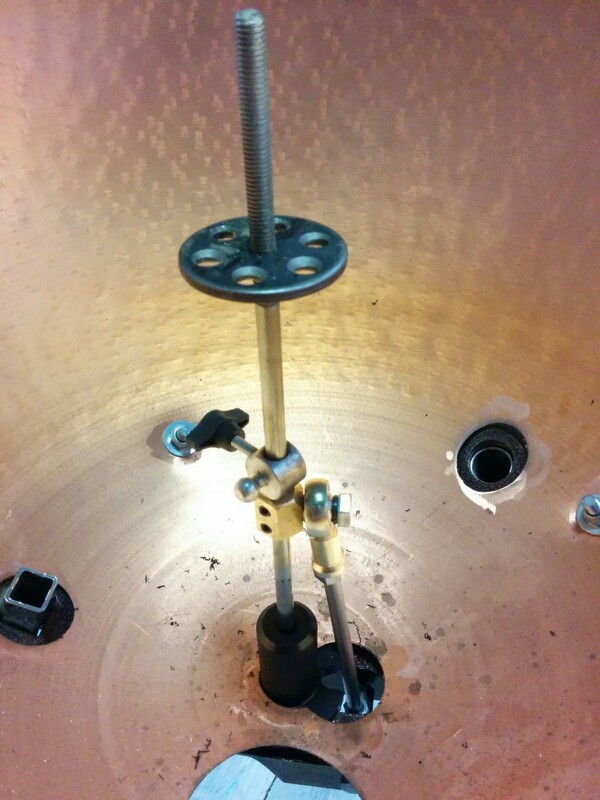 After I have finished inverting the drums, the tuning guages can be looked at. 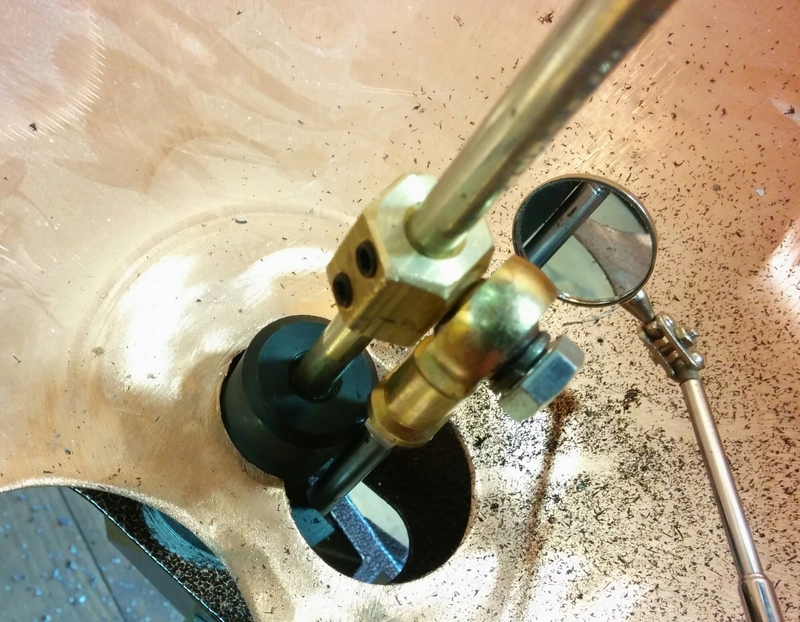 I did have to change the length of the linkage rod between the guages and the fixing point on the central rod because I had moved the fixing point higher up the drum (Obviously I had to shorten them). What I noticed was excessive wear on the socket joints, so new sockets were fitted. Finally all the other rods joined to the spider and the heads can be put on. 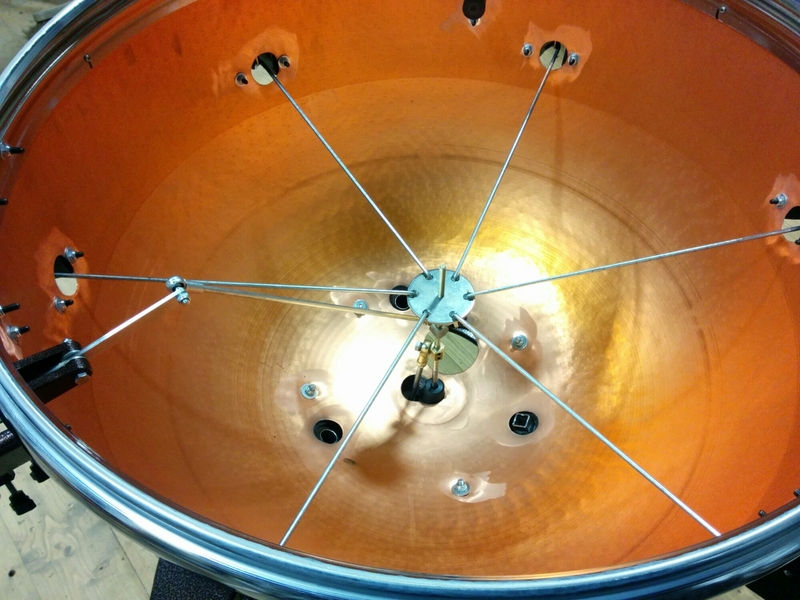 It is unusual for me to put on clear heads, but interesting because you can see what is going on inside the drum when everything is up and running. When the customer was collecting the timps, we were setting the heights, and we noticed that the legs foul the rods inside. 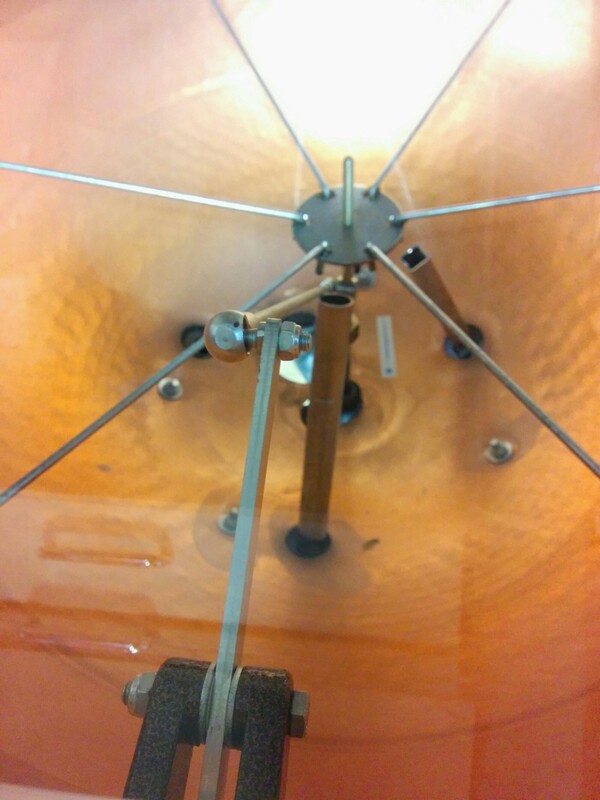 In the photo above in the foreground is the guage with its link rod receding towards the central pull rod which is behind the leg. Notice how the leg is touching the link rod. My first thoughts were I had made a mistake, but after looking at each drum individually and thinking about it, I realised that I had inadvertently nearly (but not quite) resolved the issue by moving the central pull rod back and the guage linkage higher. The mistake I made was the assumption that Adams had made things correctly. If there is one cardinal sin in my work, it is to assume that things are made correctly. This of course explains the excessive wear on the guage linkages, obviously whenever the legs are pushed into the bowl, they are bending things out of their way. 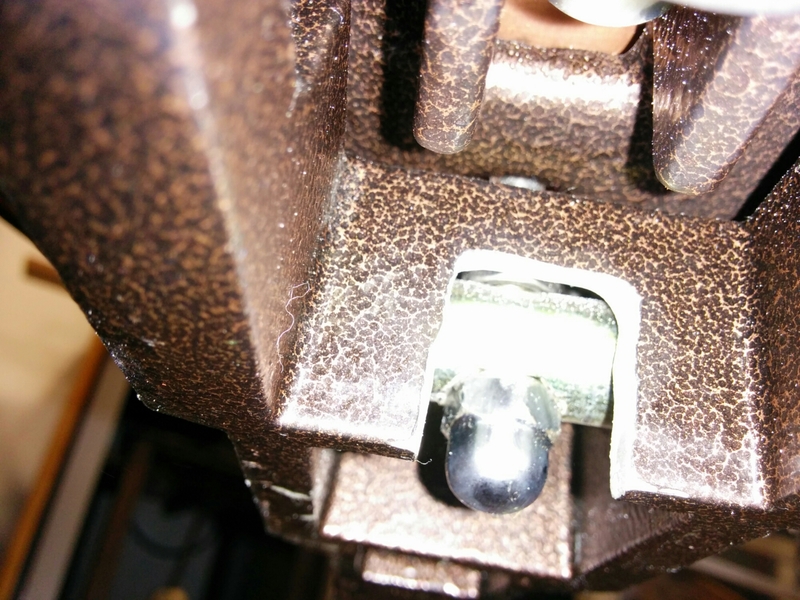 All in all, we were not impressed – another schoolboy error by one of the major manufacturers that I have to resolve. 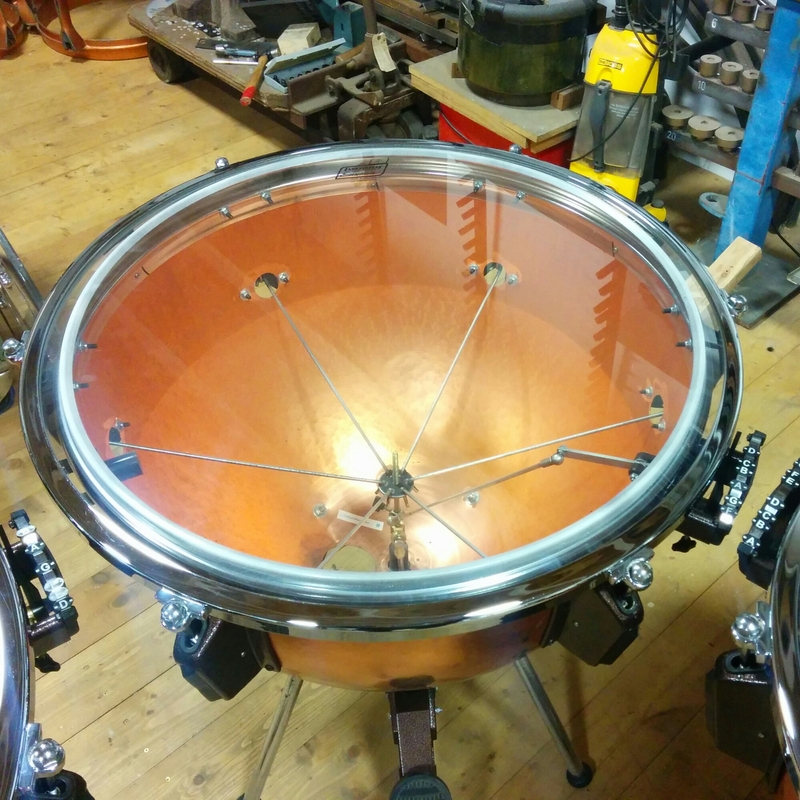 This is why it takes time for me to overhaul timpani, the list of model specific problems that I rectify continually grows!